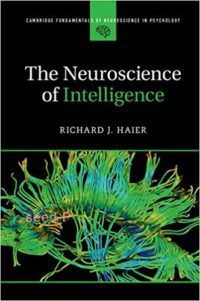 SYNTHESIS: A neuroscience-heavy, research-rich review of the evidence, myths and future of our understanding of intelligence – including what it is, why some people have it and what can be done to enhance it – by psychologist and professor, Richard J. Haier. Specific Intelligence: The ability to quickly solve specific types of problem (e.g., reasoning, spatial ability, memory, processing speed, vocabulary). General Intelligence (g): A core, general ability to quickly solve many types of novel problems. How can we measure g? Psychometric tests are still the best (/only) way to approximate g (though imperfect and only ever peer-relative). Neuroimaging is not yet practical for predicting intelligence but that could change in the future. g (as estimated above) correlates with many real-world outcomes like general learning ability, job performance and adult mortality, regardless of socio-economic status. Establishing the primary cause(s) of g and the potential ability to enhance it, therefore, have important implications for educational and social policy. What causes g (nature/nurture)? A controversial topic. Recent evidence suggests roles for genetic and early environmental factors. All we know for sure for now is that the story is complex – made more so by numerous emerging research methods and conflicting findings, not all of which are rigorous or replicable. Anatomical: Neuroimaging studies support theories such as P-FIT (Parieto-frontal Integration Theory) which propose that g depends on the functioning of and coordination between several distributed structures in the brain. Biological: Evidence point to a probabilistic combination of genetic (nature) and epigenetic (nature + nurture) factors (i.e., predispositions + environment => intelligence) though much more research is needed to explore and identify specific factors. How can we enhance intelligence? There are currently no proven ways to enhance g with a compelling weight of evidence behind them. Myths that lack evidence but are widely believed include listening to classical music (The Mozart Effect), general memory training and playing computer games. Opportunities: Will depend on further research but psychoactive drugs and genetics are promising. Chronometric (neural, speed based testing) assessments may give us an absolute way to measure g.
Neural studies of memory and super-memory may shed more light on and give ways to enhance g.
Increasingly granular measurement and manipulation (e.g., via opto– and chemogenetics) of neural circuits in animal models may unlock insights that can be extrapolated to humans. Developments in biotech may allow us to bridge human and machine intelligence circuit by circuit, leading to profound advances in our understanding of both. Imaging studies of consciousness and creativity may prove a fruitful avenue for investigating g.
The more we learn about intelligence, the more pressingly we must engage morally and practically with issues of Neuro-Poverty (aspects of poverty that result mostly from the genetic aspects of intelligence) and Neuro-Social-Economic-Status in Public Policy. On the role of time and changing support factors in g: How do we consider g on a day-by-day or even hour-by-hour basis? A “bright” person with poor mood, energy and attention management may perform exceptionally some days but poorly on others. Are they more or less intelligent than someone who scores lower than the first’s top scores but higher than them on average due to more consistent management of these factors? Sections – Clearly presents the debate mixing hard science and clear English. Summary – Recaps the main arguments. Review questions – Tests active recall. Further reading – Points to more of the same. The layout and contents of the glossary, index and reference sections of the book are also good. What is Intelligence? Do You Know It When You See It? Why Do Myths About Intelligence Definitions and Measurement Persist? Functional Brain Efficiency – is Seeing Believing? Are “Intelligence” and “Reasoning” Synonyms? 5 – THE HOLY GRAIL: CAN NEUROSCIENCE BOOST INTELLIGENCE? Case 3: Can Computer Games for Children Raise IQ? Where are the IQ Pills? 6 – NEUROSCIENCE ADVANCES, WHAT’S NEXT FOR INTELLIGENCE RESEARCH?